OLD AND NEW: Conventional lithography exposes a photoresist to ultraviolet light. An etchant then removes the exposed part of the photoresist. Self-assembly patterning occurs when a diblock copolymer is heated, thereby separating the two polymers in the material into defined areas before the PMMA is etched away. The template of cyclindrical holes is transferred into the silicon dioxide before the holes are filled with nanocrystalline silicon used to store data (steps not shown). Self-assembly has become a critical implement in the toolbox of nanotechnologists. Scientists and engineers who explore the nano realm posit that the same types of forces that construct a snowflake--the natural attractions and repulsions that prompt molecules to form intricate patterns--can build useful structures--say, medical implants or components in electronic chips. So far much of the work related to self-assembling nanostructures has been nothing more than demonstrations in university laboratories. To go beyond being a scientific curiosity, these nanotech materials and techniques will have to get from benchtop to a $2-billion semiconductor fabrication facility. Four years ago two members of the technical staff at the IBM Thomas J. Watson Research Center in Yorktown Heights, N.Y., began to contemplate how they might transform the vision of self-assembly into a practical reality. The collaborators, Charles Black and Kathryn Guarini, knew that the grand academic ambitions of making an entire set of chip circuits from self-assembly had to be set aside. Instead the best way to begin, they thought, might be to replace a single manufacturing step. "The idea was that if we could ease the burden in any of the hundreds of steps to make a chip, we should take advantage of that," Black says. They first had to select what type of molecules might self-construct without disrupting routine silicon manufacturing practices. Polymers were an obvious choice. They make up the "resist" used in photolithography--the material that, once exposed to ultraviolet or shorter-wavelength light, is washed away to form a circuit pattern. During the first two years of their quest, the duo spent time learning about polymers and the optimal temperatures and thicknesses at which they would self-assemble. They built on the work of Craig J. Hawker of the IBM Almaden Research Center in San Jose, Calif., and that of former IBMer Thomas P. Russell, a polymer scientist at the University of Massachusetts at Amherst. Both had done research on how polymers self-assemble on silicon. With this knowledge, Black and Guarini even started making things. 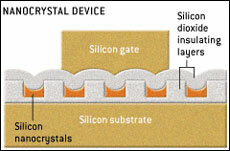 FLASH MEMORY: A layer of self-assembled silicon nanocrystals is inserted into an otherwise standard device as part of a novel IBM manufacturing process. The two researchers appeared at conferences, giving presentations about honeycomb patterns that had self-assembled. But that accomplishment consisted of little more than PowerPoints, the type of through-the-microscope images found in abundance at any academic conference on nanotechnology. What would the nano patterns be good for? How could they be integrated into a fabrication line? Could they best circuit-patterning techniques that had already received hundreds of millions of dollars of investment? Finally, last year, the pair demonstrated how a self-assembled honeycomb pattern might work in a real manufacturing facility. The material chosen for the demo was a diblock copolymer, one in which two polymers--in this case, polystyrene (Styrofoam) and polymethylmethacrylate (Plexiglas, or PMMA)--are tied together by chemical bonds. When spun onto the surface of a rotating silicon wafer, the two polymers separate, as if they were oil and water. Although the molecules stretch out, the chemical bonds keep them attached. Subsequent heat treatment exacerbates this elongation. In the end, PMMA ends up concentrated in small cylinders surrounded on all sides by the polystyrene. The diblock copolymer thus forms on its own into a nearly complete honeycomblike template. 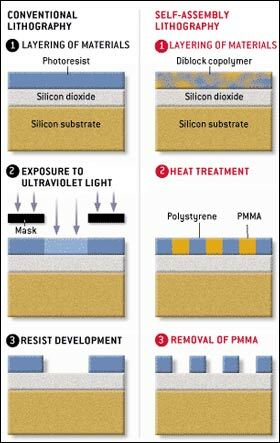 To finish creating the 20-nanometer-wide pores, an organic etching solvent removes the PMMA. A subsequent etching step transfers the same honeycomb pattern into an underlying layer of more robust silicon dioxide. Then a coating of amorphous silicon gets deposited across the surface of the wafer. A gas etches away the silicon except for that deposited in the holes. All that is left are nanocrystalline cylinders surrounded by silicon dioxide. The final steps place an insulating layer and a block of silicon atop the structure, the block forming a "gate" that turns the electronic device off and on. Black and Guarini's honeycomb results in a nanostructure that is part of a working flash-memory device, the kind that retains digital bits even when a camera or a voice recorder is turned off. The nanocrystalline cylinders form capacitors where data are stored. Manufacturing engineers are leery of introducing new technologies unless a researcher can make a very good case for their adoption. Self-assembly potentially fits the bill. Creating closely spaced holes for a flash memory would prove exceedingly difficult with ordinary lithographic and deposition methods. Forming nanocrystals using conventional techniques creates elements of different sizes that are all jumbled together. In contrast, the self-assembled nanocrystals are evenly spaced and of uniform size, improving their durability and their capacity to retain a charge while allowing the cylinders to shrink to smaller than 20 nanometers. The IBM demonstration served as proof of principle in the strictest sense of the expression. The company has not made commercial flash memories for years, so the invention could not be applied immediately to improve its own manufacturing operations. But the nanocrystals enabled the pair of researchers to flaunt this type of nano patterning. "Politically in the company maybe it wasn't the smartest demonstration we could have done, but everybody was supportive and could see the power of the technology," Black says. The understanding gained of how to integrate nanomanufacturing with conventional chipmaking may provide new approaches to fabricating other IBM electronic components. Making holes and filling them could create "decoupling" capacitors recessed into the chip substrate that smooth out fluctuations in the power supplied to a chip. Using a variant of nano patterning, a self-assembling polymer could also create tiny, finger-shaped silicon protrusions sticking up from the underlying substrate. These fingers would constitute the "channel" in a transistor through which electrons flow--but one in which electrons flow vertically instead of across a chip, as in today's devices. The gate to turn the transistor off and on could encircle the silicon finger. The geometry might prevent electrons from "tunneling," or leaking, through the channel when the transistor is in the off state, a constant threat when feature sizes become very small. Ultimately, self-assembly might play a much bigger role in fashioning electronic circuits. But the incrementalist approach of Black and Guarini may represent the most promising way to get nanotechnology adopted as a real manufacturing tool. "The greatest excitement is that these materials aren't just in the polymer-science laboratory anymore," Black says. A small step for small manufacturing.